There was the smell of gasoline afterward, said a mosque official. 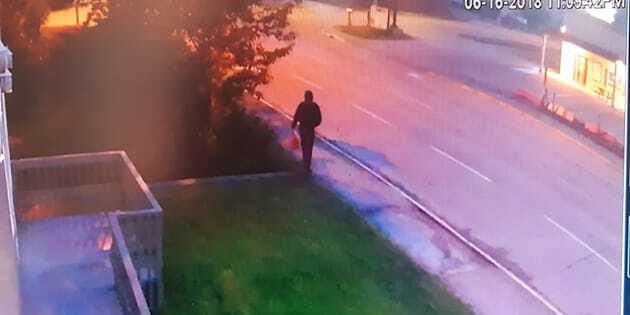 Security footage shows a figure walking away from a mosque in Edson, Alberta moments after a fire broke out. EDSON, Alta. — RCMP in Alberta say they're investigating an arson at a mosque in a community west of Edmonton. Police say damage to the Edson Mosque on Saturday night was minor and that no one was injured. But Toufik Baterdouk, vice-president of Islamic Society of Edson and Masjid, says the case is disturbing because several members of the mosque had just finished prayers and were still in the parking lot when the flames broke out. Baterdouk says the fire damaged the front door and some siding, and there was an odour of gasoline around the door afterward. He says security footage appears to show someone with a bag walking away from the mosque just moments after the fire began. Damage to a door of a mosque in Edson, Alta. is shown in a handout photo. RCMP in Alberta say they're investigating an arson at a mosque in a community west of Edmonton. Baterdouk says the mosque in Edson has been open for about five years and there have never been problems before. "I grew up here, my kids were born here, three generations of my family live here," Baterdouk said. "This is a great town and we've never really had any issues." Police said they're seeking the public's help identifying whoever is responsible. The fire happened in the middle of the three days when members of the mosque were celebrating Eid al-Fitr, the holiday which marks the end of Ramadan. Baterdouk said the mosque members who were in the parking lot phoned the fire department, and he said firefighters arrived quickly, which helped minimize the damage. "Each parent is trying to find the best way to explain why something like this might happen," Baterdouk said. Baterdouk said that when they were building the mosque, there was a lot of help and support from the town. And when they hold open houses, he said they're attended by MPs, members of the legislature and the mayor. "This is a great town and a great community to live in and to be a part of it," he said. "So the acts of this individual or couple of individuals, whatever may be the case, we do not want that to reflect badly on our town." Alberta Premier Rachel Notley issued a statement on Sunday, calling the incident "an affront to all Albertans." "I want Alberta's Muslim community to know that your government stands with you. So too do Albertans of all faiths. And we will defend you from those who perpetrate such acts of hate," she wrote. United Conservative Party leader Jason Kenney also condemned the attack.